That pretty much sums it up. We are drunk on pie over here. Traditional round ones, hand pies, pie bites, pies in a jar… if it’s an iteration of pie, we are all over it. Here at Pie Eyed, we’re not going for perfect. You won’t find us fretting over sticky pie dough or a fruit pie that is runny. Rather, we believe that if you made it yourself, it’s better than anything you can buy at the store. More importantly, we believe that making pie actually encourages us to accept our imperfections and focus on what truly makes something beautiful. 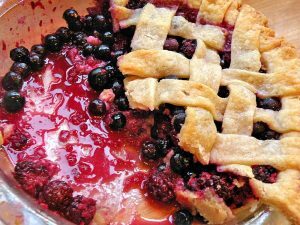 We love the challenge of making pie and the lessons we learn from each journey and we want you to join us! What is is about pie that has us so enamored? To us, pie is more than a delicious dessert. It’s become a lifestyle. We affectionately say that we’re living the pie life. Making pie and sharing it with others has become a way to approach life in a simple, beautiful and generous way. If you find yourself nodding in agreement, feeling this same passion and enthusiasm for pie, join us! We want to encourage others to make pie while building a community that appreciates the power of sharing food with others.